Security and safety are fundamental to the reputation and profitability of any company, and safety and security begin with the employees. According to statistics from 2008, conducted by Eurostat, Romania has the highest incidence of fatal work accidents with 8.0 per 100 000 persons. In this context, concern for safety and security at work is not only justified, but necessary. Studies show that these risky behaviors can be assessed using validated psychometric instruments. We aim through this event to meet organizations that face such situations with solutions and best practices in order to reduce the incidence of accidents at work, increase overall quality and protect the company's reputation. The event is dedicated to human resource specialists and HR Managers, Health & Safety Managers, Plant Managers, Directors General, in areas such as manufacturing, construction, energy, transportation, healthcare and retail. The purpose of the event is to disseminate knowledge and best practice in health and safety at work. 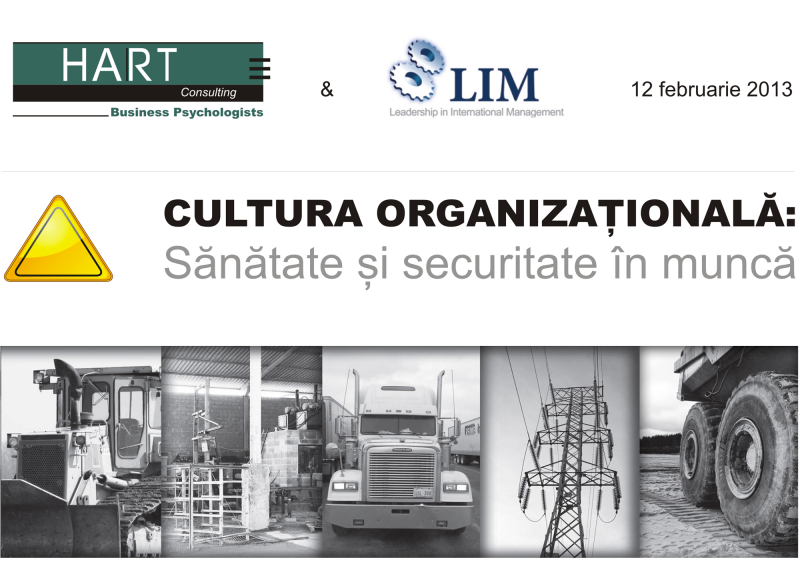 Transformation of labor protection and safety culture in organizations by using the methodology ARL – Action. Reflection. Learning. branded by LIM. LIM, Leadership in International Management works on global market for 27 years, offering consulting services and coaching in converting organizational culture, leadership development skills, training and internal coach training, developing high performance teams. Our interventions are tailored for multi-cultural environments being tested in countries across 5 continents. Gi Group`s core expertise consists in designing and implementing flexible, innovative employment solutions, especially in the area of temporary staffing, solutions which secure flexibility and cost-efficiency for any business, regardless of industry or size. The company is founding member of ARAMT (The Romanian Staffing Association), Eurociett (The European Confederation of Work Agencies) and Ciett (The International Confederation of Work Agencies). Gi Group Romania is structured in the following divisions:Gi Group temporary staffing: implementing temporary staffing assignments; Barnett McCall search and selection: consultants specialized by industries, with a better knowledge of the assigned market and active candidate networks, organized in vertically integrated divisions, targeting specialists and management; ePayPoint: outsourcing payroll and personnel administration.